Released back in 2002, the original Kingdom Hearts captured the hearts (no pun intended) of gamers around the world with a world unlike anything we’d seen before. No one could have predicted the success that was going to come about from the Disney and Final Fantasy brands joining forces for a new RPG title. 11 years later and just a few months after the long awaited announcement of Kingdom Hearts III, Square Enix has released an HD collection containing Kingdom Hearts Final Mix (first time it’s playable outside of Japan), Re:Chain of Memories and 358/2 Days (a near 3 hour cinematic movie rather than the playable game). 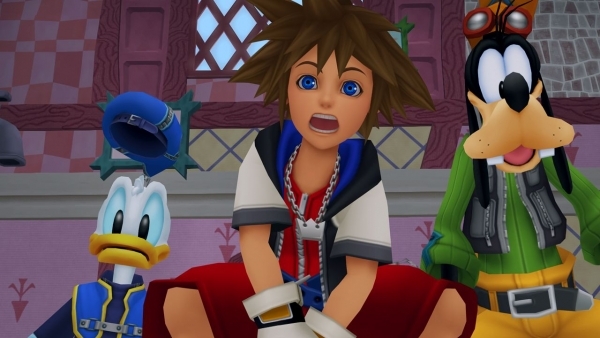 Can Square successfully introduce Kingdom Hearts to those that missed out on the series originally, whilst giving old fans a reason to come back for more quality time with Sora, Donald and Goofy? If you are unfamiliar with the plot of Kingdom Hearts, the basis of the story centres around a boy named Sora who is gifted with the ability to hold the keyblade, the ultimate weapon against the heartless (beings tainted by the darkness). With his companions Donald Duck and Goofy, he sets out to rid numerous worlds of the heartless with the hope of finding his friends Riku and Kairi along the way. As the first and least complex of the series, Kingdom Hearts boasts the easiest plot to follow which at its core is all about friendship. Sora’s friends from his island and the friends he meets during his journey help him become stronger both mentally and physically, and the game does a good job of portraying that as the moments where Sora is by himself, you get this feeling of sorrow that stays with you until Sora manages to reunite with his friends. His friendship with Donald and Goofy is filled with happiness, tension, laughter and sorrow, all of which help to make their bond feel realistic as well as a great watch during cutscenes. Your favorite trio are back! The selection of villains that oppose Sora on his quest make for a formidable force, with the cold Maleficent and oh-so-awesome Hades standing out above the rest as the most memorable. Seeing an array of legendary Disney evildoers interacting is a real treat for those that have seen the specific films they were in. Setting up the events of Kingdom Hearts II, Re:Chain of Memories follows right on from where the first game left off as Sora, Donald and Goofy explore the enigmatic Castle Oblivion where members of Organization XIII, Kingdom Hearts II’s main antagonists, plot a sinister plan involving Sora. Also unknown to him, is that his best friend Riku is also exploring Castle Oblivion whilst trying to come to terms with what he had become in the first Kingdom Hearts. Neither of Sora or Riku’s stories manages to touch the plot of the first game, feeling like filler for the most part, though the final third of Sora’s does a good job of getting you excited for Kingdom Hearts II. It could be argued that the reason the plot is forgettable for the most part is due to the game originally being released on the Game Boy Advance, however that doesn’t excuse how little the plot seems to advance when you are in each Disney world (as in Riku’s case, there is zero story development whilst in Disney worlds due to him having minimal connection to any of the worlds or characters outside of Hollow Bastion). Unlike the previous two KH titles, 358/2 days doesn’t follow Sora, instead focusing on Roxas, his nobody that was born in Kingdom Hearts. Chronicling his time from when he joined Organization XIII to the opening of Kingdom Hearts II, you get to see the majority of Roxas’ life which involves going on missions with other members of the organization and eating sea salt ice cream with his friends and fellow organization members Axel and Xion. It’s the latter that takes up a lot of the story, yet in doing so it manages to create a believable friendship between the three thanks in majority to Axel, who is one of the better written characters in the series, harnessing a cool, friendly and confident personality that you would generally want in a friend. 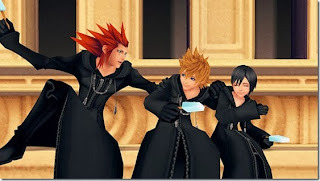 It’s for that reason why the events that happen to the three friends have such an impact, carrying over to Axel’s actions in Kingdom Hearts II. Just like the first game, 358/2 days’ plot has a strong focus on friendship that while not the easiest to sit through due to repetitive scenes, does a good job at explaining the background behind many of the events that occurred in prior games. The gameplay in Kingdom Hearts remains much the same, which is great news for Kingdom Hearts enthusiasts. The action RPG combat hasn’t been touched so be ready to swing your keyblade, dodge, roll away from enemy attacks and summon legendary Disney faces whilst dealing with the same frustrating camera we all remember from the original. The tedious gummi ship sections of the game also remain untouched so be warned, as you’re going to have quite a bit of flying to do once again. It’s hard to argue with the difficulty of the game, starting off rather simple yet becoming shockingly tricky towards the end. You’re going to feel genuinely pleased with yourself when you get through some of the games latter battles, which become a real test as to how well you have become accustomed to the games different heartless types as well as the way you have distributed your AP (ability points) on skills. Going from Final Mix to Re:CoM isn’t as easy as you may think. 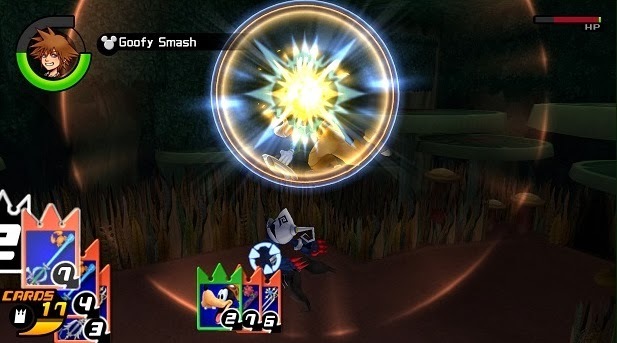 Utilising cards for battle, fighting in enclosed areas, Sora fighting by himself, it all feels like a real downgrade from the action of the previous game. The way in which you battle by using decks of cards, results in a much more tactical style of gameplay, which while not necessarily bad manages to hurt the flow of battle created by the first KH, thus feeling slow and just not as enjoyable. All of the worlds from Kingdom Hearts return in Re:CoM, along with Twilight Town from Kingdom Hearts II. The design of each world now feels less like an actual world and more like a very basic maze, as they’re made up of a series of connected rooms. As a result, no significant levels end up being memorable which is a shame after some excellent worlds in Kingdom Hearts such as Halloween Town, Agrabah and Hollow Bastion. Rebirth mode, which unlocks when you finish Sora’s story, works a lot simpler then the main mode. Playing as Riku, you can no longer customize your card decks and reloading your cards now works in an instant. This has its positives and negatives, as the combat feels a little faster yet most battles are reduced to button mashing. Admittedly playing as Riku offers a nice change from Sora, since Riku has his own fight animations, weapons and skills. The graphics of all three Kingdom Hearts games not only met my expectations, but managed to exceed them with bright crisp visuals that looked right at home on the PlayStation 3. The detail of the characters clothing looked particularly sharp, helping me to notice designs that I hadn’t previously taken in when playing the original. Text looked sharp and easy to read, and there wasn’t a hint of blurriness from what I got to play, which was certainly a relief due to reports from those that had previewed the game. Now as great as the HD visuals can look, they manage to make the more basic cutscenes look off due to the type of textures used for the faces and eyes, making the characters (Sora in particular) look emotionless at times. It’s a real shame when you consider just how gorgeous the models look during the higher quality cutscenes, with the characters eyes looking particularly amazing. Funnily enough, Re:Chain of Memories doesn’t feature this problem as much, making the cutscenes a lot more consistent then Final Mix. Having been rerecorded, the music across all three games still sounds as amazing as ever thanks to the musical brilliance of Yoko Shimomura. There were so many times during my playthrough of Final Mix that I found myself smiling when one of those memorable themes hit, especially in Traverse Town and Hollow Bastion. Voice work remains solid for the most part, especially in Re:CoM and 358/2 days as by this time, the voice of Sora (Haley Joel Osment) is a lot deeper and different from Final Mix (due to the first Kingdom Hearts coming out 5 years before Re:CoM), which while awkward at first due to it not really matching Sora’s appearance, is less annoying then his original voice. 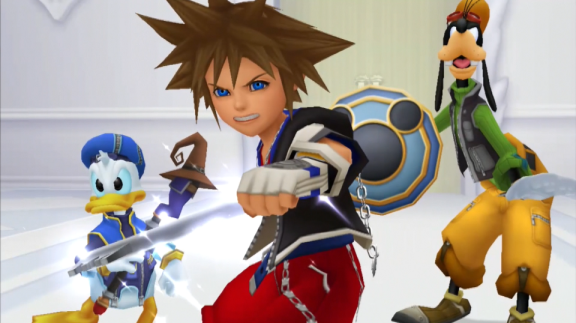 To those that played the original Kingdom Hearts; you owe it to yourselves to re-join Sora, Donald and Goofy in their adventures across so many magical Disney worlds. 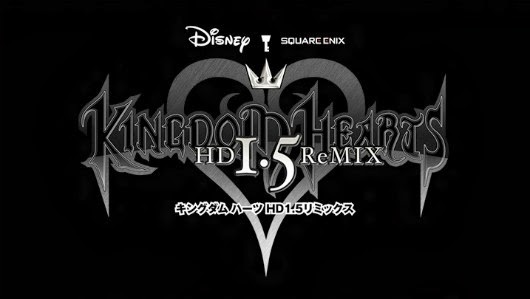 Final Mix in particular is still a great adventure that looks even better now and is a great taster of what’s to come with the recently announced Kingdom Hearts 2.5 HD ReMIX and Kingdom Hearts III. As for those that are intrigued by the series, but never picked it up during its time on the PlayStation 2, if you love Final Fantasy, Disney, RPG’s or any combination of the three, then there is no reason why you shouldn’t pick this HD remix up.